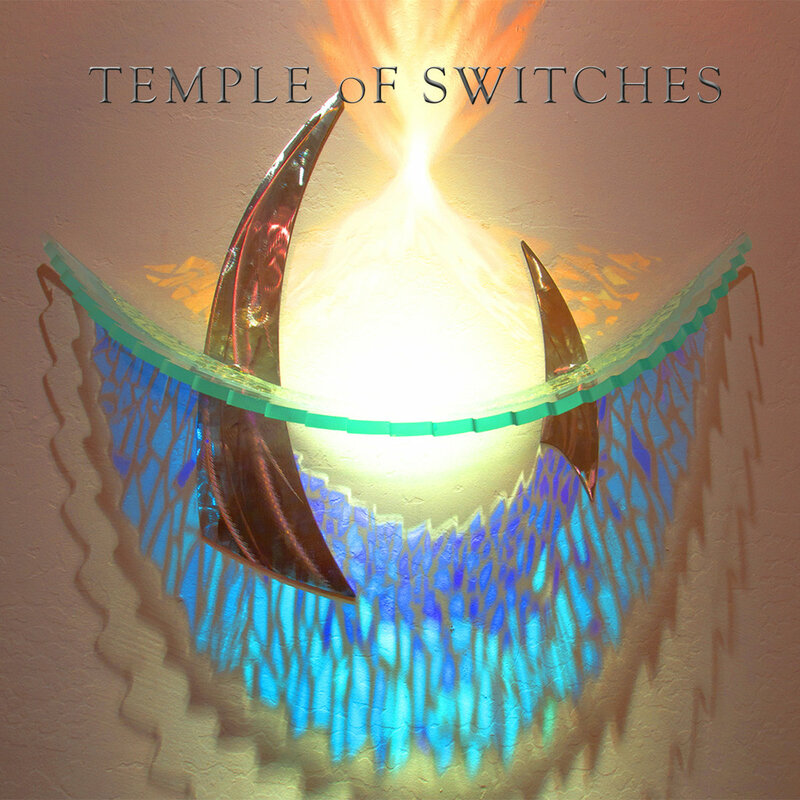 Buellton, CA based progressive rock quartet Temple of Switches released their self-titled debut album in November, and in the interview below guitarist Mike Monda and bassist Joe Monda talk about it. Define the mission of Temple of Switches. Mike (guitar): Our mission is to create melodic and dramatic music with a massive underlying power which is not fuelled by brashness nor speed. Tell me about the creative process that informed your album “Temple of Switches” and the theme it captures. Mike (guitar) There were a couple of approaches. A few of the songs were written decades ago in my old band “Merry Cloud”. It was a three piece band, guitar, bass and drums. When we began this project Kevin (keyboards and vocals) took interest in the songs and began writing keyboard parts to them. Kevin is really creative and fluid, and would experiment with sounds and melodies and would play different ideas each time we played. We recorded all the rehearsals and I would review them and tell him “listen to what you played here”!!! and he would either dismiss or embrace those ideas. He also ended up adding entirely new parts to some of the songs as well. At rehearsals Jay would frequently call things to a halt, and develop a rhythmic idea that would pop into his head. Other songs were born of improvisation, upon which reviewing the recordings, permanent ideas were wrought. If there is an underlying theme it is in the thickness of the sound. What is the message you are trying to give with “Temple of Switches”? Mike (guitar): A sixteen track recording console did the trick nicely! Mike (guitar) The latter. Each of us had ideas as far as the dynamics of the songs. None of us conducted, or dictated the dynamics. We just listened to each other and knew when to back off and when to put the hammer down. Joe (bass): Definitely the latter, because if it was carefully architected it would not be the same… It’s organic. Mike (guitar): The drums went down first. Jay had the toughest job because his parts were demanding both physically and in complexity, and he had to lay them down in real time. While we recorded Jay, the rest of us plugged into the board direct, turned off the amps and listened to the whole band through the cans. We all stood in the same room with Jay and had eye contact. Kevin whispered the lyrics into the mic to cue the changes. Then the rest of us laid down our parts in our home studios. Kevin borrowed an old Leslie and recorded his organ through it. That contributes a ton to our sound on the CD. Joe lives over four hundred miles away from us. He did his parts remotely and transferred the tracks to us over the web. Joe (bass): I would get the drum track, and maybe a whisper voice track or a guitar track if necessary, then lay down the bass line at my home studio. If they liked what they heard when I sent it to them we were good to go. Computers were a great asset for us… Adding more switches to the temple. How long “Temple of Switches” was in the making? Mike (guitar): We have been in the making since around 1980 in forms other than “Temple of Switches”, but took a twenty year vacation between 1992 and 2012. We started Temple in 2012. Joe (bass): I’ve been practicing and playing for years, but just recently had the opportunity to play for ToS. It’s the first time in my life that my brother and I have had the opportunity to play together. Mike (guitar): You always hate to be pigeonholed, but I would have to point to the British prog rock bands of the late seventies. As well bands like Rush and Kansas. Joe (bass): Rush. Definitely Rush. Mike (guitar): Technology has made things really convenient. As far as recording it is a godsend, there are too many advantages to mention. As far as the instruments and sound, it’s now a lot less expensive to get the sounds you are looking for. As Kevin pointed out once, it’s funny that you can use a program which emulates the sound of a Mellotron, which emulates the sound of a string section… I think we would all prefer to use the old analog equipment if we could afford to, and if we had the will to lug it around. Joe (bass): For some of the things, like ease of recording and practicing, technology is a definite necessity. But I think effects can be easily overused as well. We are definitely not an autotune kind of band. Joe (bass): [laughs] I agree with Mike, but it can also be used for a table shim when not being listened to. Mike (guitar): Start from scratch and write new music with a massive underlying power which is not fuelled by brashness nor speed.